I’ve been taking a break from making pottery until my kids get a little older and I can spend more time in the studio without interruptions. I’m hoping to able to make new work again next summer. Your work is very inspirational, and maybe one day I will be able to attend one of your workshops. I also learned from John Glick to throw standing. I attended a workshop given by John at the Ann Arbor Potters’ guild in 2002 and have been standing while throwing ever since. If someone could teach me how to garden with a back saving procedure I would gladly pay them. I belie every student should learn to throw this way. 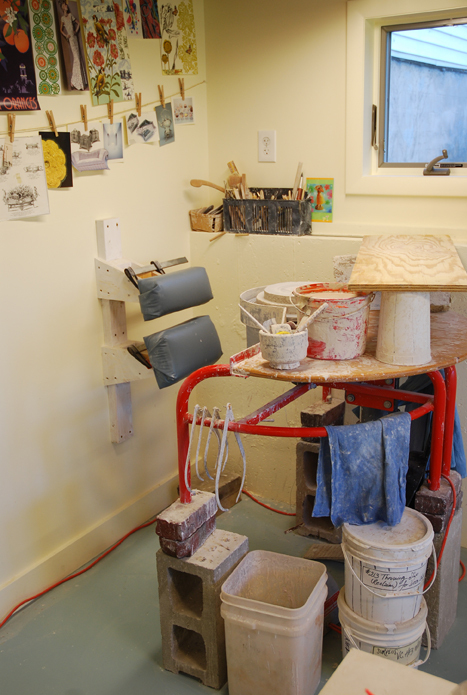 It’s been a lifesaver in my ability to continuing the development of my skills and I didn’t have to give up pottery!